Called a Digital Dale Carnegie and the Tony Robbins of Tech, Erik Qualman is the author of Socialnomics. Socialnomics made Amazon’s #1 Best Selling List for the US, Japan, UK, Canada, Portugal, Italy, China, Korea and Germany, and was a finalist for ”Book of the Year.” His book Digital Leader helped him be voted the 2nd “Most Likeable Author in the World” behind Harry Potter author J.K. Rowling. He is no stranger to the executive suite, having served as the Head of Marketing at Travelzoo (TZOO). Yet, he may be best known for writing and producing the world’s most watched social media video. His YouTube video What Happens in Vegas Stays on YouTube is being adopted by the top universities and global brands and was nominated for the 2015 Pulitzer Prize! His work has been highlighted on 60 Minutes, The New York Times, WSJ, USA Today, ABC News, Financial Times, Forbes, CBS News, and The Huffington Post. 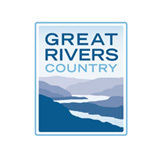 Sponsored by Great Rivers Country.